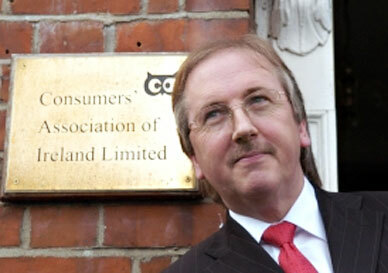 It is my great pleasure to extend a warm welcome to you on behalf of the Consumers’ Association of Ireland (CAI). I sincerely hope that you benefit from your visit and from the services and links that the site has to offer. By way of introduction, let me state that the Consumers’ Association is Ireland’s independent, self-funded and non-profit organisation, founded in 1966. Its members are ordinary consumers from areas spread right across the country who see the need for and who support such an organisation. Each year those members are invited to nominate and elect a Council who will represent the Association. Those Council members appoint a Chairperson and Officers to oversee the activities of the CAI. It is especially noteworthy that they give voluntarily of their time and expertise. They are supported by myself, Clodagh O’Donoghue our Managing Editor of the Association’s magazine, Consumer Choice, as well as some few part-time, freelance and intern staff. We have now passed the 50 year age barrier and I note how across those years the CAI has continuously and strenuously represented and fought to protect and strengthen the rights of its members and all Irish consumers. The achievements have been considerable. Consumers’ rights – the right to information, fair dealing, protection, education, safety – all culminating in the ability to make informed decisions and choices – are a reality. That said, there is much more work to be done to protect consumer rights in a significantly and rapidly changing marketplace for goods and services. To do that requires resources. We have long been calling for Government recognition of our crucial role through the provision of some essential core funding. Recognition did come in 2001 with the allocation of a much appreciated €63,000. However, that sum was then determined not to be core support but rather specifically project based. This had the effect of costing the CAI additional funds from depleting resources simply to see the projects to professional culmination. In addition, the sums approved reduced over the years to just over €28,000 in 2010 and marking the end of all support to the CAI. 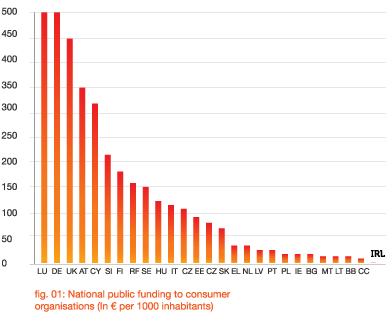 Take a look at the graph to the right to see just how poorly we compare to our EU colleagues where their efforts and exceptionally unique funding difficulties are valued, acknowledged and encouraged and where independent consumer representation is supported! I have to be honest, the income derived from our members’ subscriptions is insufficient to permit us to lobby as we should and the need for determined lobbying and input at home, in Europe and increasingly, internationally, is vital for the future of consumer protection. We do not and cannot accept any commercial source of funding and so our ability to raise alternative funds is virtually non-existent. We proudly display the banner of our independence but, in comparison to almost every other NGO and ‘charitable’ organisation in Ireland, we are starkly different and entirely reliant upon the monetary support of the ordinary taxpaying consumer/Member. The Consumers’ Association of Ireland will prevail – of that there is no question – but, to grow must be our goal and I hope that you will consider supporting and joining with us in order that we might go forward forcefully and grow quickly. Only then can we, independently, demand the better protection, the clearer transparency and the proper ethical standards – from a position of strength – supported by the majority of consumers, for the benefit of all consumers.